German cutlery maker Wusthof combines Western and Japanese influences to create their Wusthof Classic 17cm Oriental Cooks Knife. This knife has the very sharp blade found in most Japanese chef knives, with an added heft thanks to a European influence, to handle more heavy duty jobs. 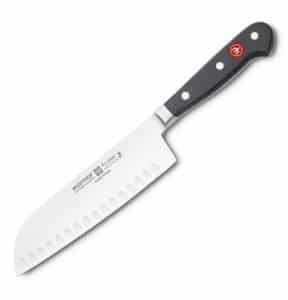 Performance wise the Wusthof Classic 18cm Oriental Cooks Knife outshines other similarly priced options. Unlike some Santoku knives, the Wusthof Oriental Cooks Knife handles thicker vegetables and meats with ease thanks to its additional bulk. The handle is comfortable, and secure, making this knife easy to use for beginner chefs. The blade itself has a hollow edge. A hollow edge creates tiny air pockets along the blade, which helps prevent bits of food from sticking to the blade. Like any good Santoku, the Wusthof Classic 17cm Oriental Cooks Knife is lightweight and well balanced. The handle is well weighted with three stainless steel rivets, with a bolster for balancing the hefty German steel. The heavier German style mixed with a Japanese style blade creates an interesting dynamic of precision and force. In this sense, it is unique amongst other Japanese chef knives on our list. While this is a quality blade for any chef, it is especially made to be beginner friendly. It’s lightweight, but still has the heft to handle most jobs, making it a solid all around knife. It’s balanced and easily controlled making it comfortable in hand and easy to grip. One of the benefits of the santoku hollow edge blade is that when you are slicing, it does not stick to the blade, making it easier and quicker. The video below from the guys over at Surla Table show just how simple it is to use. This Japanese chefs knife is impressive too for being one of the least priciest, so it’s great if you’re looking for a higher quality knife without spending a fortune. It compared well against every knife in our review. The hollow edge, while sharp, demands more sharpening and care than your average edge. And as this is a Santoku, is must be sharpened to a more acute angle than your average Wusthof blade. The cardboard sheath included with the knife will fall apart eventually. A replacement sheath or guard would be recommended at that time. The blade is forged with German high-carbon stainless steel and shaped into a Santoku design. It features a well-balanced, ergonomic handle that is secure and comfortable to hold. The hollow edge blade creates air pockets to prevent food from sticking to the blade, which is ideal for very thin slicing. Wusthof Classic 18cm Oriental Cooks Knife – We counted this as one of the best chef japanese knives because it will fit in nearly anyone’s budget. It’s the least expensive on our list, but you wouldn’t know by looking at it. Many chefs will be impressed by its looks, and be even more happy with how well this knife cuts.